1 unit is packed in 1 polywood carton. 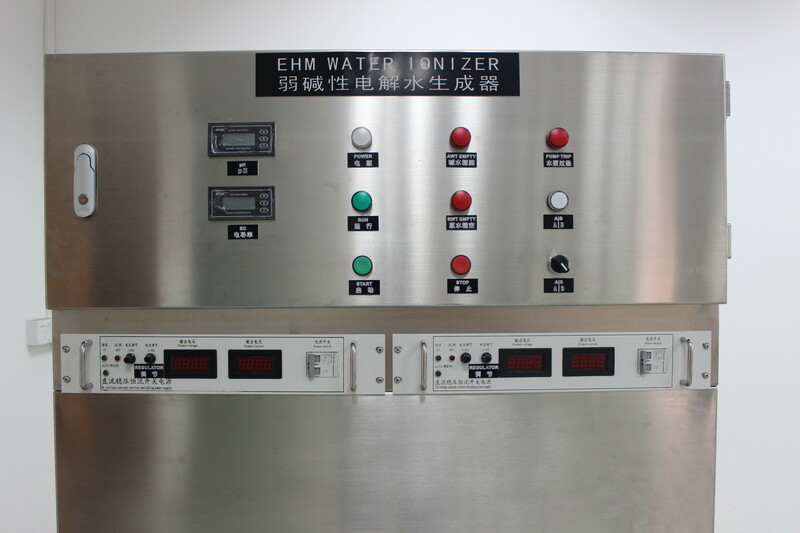 EHM's Newest High technology Industrial Alkaline & Acidity Water Ionizer, with 3000L/hour Large capacity output, for bottling water. Continuous Working large capactity water ionizer with 3000L/h alkaline or acidic water outputting. The PH value of the ionized water is between 3.0 and 10. Usage life of electrodes is more than 25000 hours. Source Water: The source water meets the standard of your country and the rigidity is less than 100mg/L and the water pressure is between 0.1 and 0.25Mpar. The rigidity of municipal water is less than 100mg/L according with national standards and the water pressure is more than 0.3Mpar. Environment temperature can be from 5 to 40°C and the humidity is less than 80%. The net weight is 570KG including the following fittings: 2 switches, 1 fuse, instructions for ORP, pH, conductivity, several plastic parts. Acidic electrolyzed oxidizing water, low PH value (3.0 or less) and high ORP (+1100 mv or above), beyond the scope of various pathogenic micro-organisms to survive and make cell membrane potential change, leading to cell membrane permeability-increasing and the destruction of cell metabolism enzymes, microbes quickly die. Meanwhile, the acidic electrolyzed oxidizing water and contains 50-80mg / L of chlorine to more effectively kill pathogenic microorganisms. With the smaller molecule, the water is easily absorbed by the body. Keep body pH balance and avoid the sub-health and diseases. Improve the food taste, and keep the nutritions in the vagetables and meats. (1) can keep the cattles health, keep their furs shining, and improve the milk production. (5) can be suitably modified alkaline soil. Under these conditions, the alkaline & acidic electrolyzed oxidizing water could be stored for at least 90 days. Safety Emissions: the acidic electrolyzed oxidizing water in irrigation or placed after a certain time, be able to restore its own ordinary water, and plants were polluting the environment and residual. Function: Produce alkalescent water for bottling water plant.